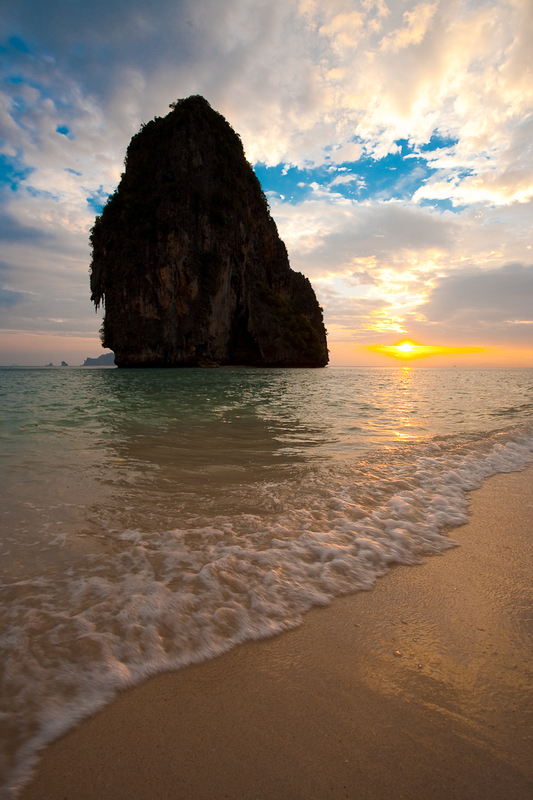 A gentle waves breaks on the shore at sunset in front of a large limestone mountain on Phranong Beach. I've finally gotten out of Bangkok for a spell to enjoy the Thai islands with my girlfriend, lady Travelguy. Despite being a traveler, I'm not much of a frequent-mover so our first stop, Railay beach in Krabi Province, may be our only stop depending on how much we enjoy it. If it gets dull, we'll move on and see what the next interesting island has to offer. Much more to come from scenic beaches in the future! LoRo, it is definitely beautiful but I think a bit overrated and jam packed with people! Give me Ko Lipe any day of the week, including Sundays!